I orginially posted this recipe back in 2009, soon after I started this blog. I always thought it had the worst photo. We recently made it again, it was super tasty as usual, so I decided to take some better photos. What do you think? Here is the original if you want to see it. Its a really sad picture. I also use a different formula for the focaccia but the original recipe will work fine. Maybe its not really a famous focaccia sandwich, but I am going to make it that way. This is the sandwich dreams are made of. I remember when my wife and I were dating when she would visit me at the pizza place where I worked: High Desert Pizza in Ivins Utah. 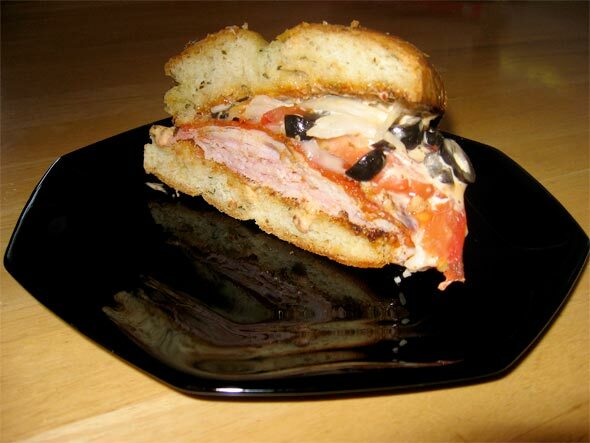 She would come and I would treat her to this tasty focaccia sandwich. We both fell in love at first bite. It took me a little while to remember all the toppings but ultimately I did. I must say thank heavens for that. Now you have to start off with the Focaccia Bread from this post. Some very tasty bread. We like it fresh out of the oven, but 1-2 day old is fine as well. This is a hot sandwich so it doesn’t matter. Cut the focaccia loaf into 4 peices (I make my focaccia round) and slice it so you have nice sandwich slices. We use our bread right out of the oven, but day old bread can be toasted on both sides under the broiler for a minute or less a side depending on how much you like yours toasted. You want them a little crunch and warm. Mix mayo and salad dressing together until it turns to a nice light orange mixture. Slather that onto all the slices of focaccia you are going to use. Meat side – you can do this two ways depending on how you like your pepperoni. First way: line the bottom slice with pepperoni on top of the tasty sauce. Then pile on the ham and then the turkey, two or three slices of each should be good. We are going to put this in the oven and want everything to be warm throughout so not too much. Second Way: Pile on the ham then the turkey then the pepperoni, this way the pepperoni gets a little crispy on the edges. Either of these ways are good. Veggie side – Pile on the onions. Add some olives onto those. Put 1-2 tomato slices on top of that. Then add a slice of the Povalone on top of all that. Put the slices on a cookie sheet or a broiler pan top. Now depending on how you like your sandwich put it under the broiler until the cheese is melted and everything is warm. Or turn the oven to 400 and cook it for about 4-5 minutes or more. Take it out, put it together and ENJOY! You won’t regret it. Well maybe your thighs will but it’s worth it!